One secret of making a film’s music popular is to play it on the radio and the TV so often that it becomes fixed in public memory well before the film is released. 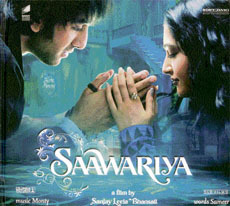 On that score, the makers of Saawariya have left no stone unturned. Whichever channel you go to, it is the music from this film which is playing and you find yourself humming one of the songs. That does not mean the songs lack quality. Some of them are really melodious. They are all the more enjoyable because they are the creations of a non-established composer (Monty). To cap it all, he has given big breaks to several newcomer singers like Shail Hada and Parthiv Gohil. The former’s effort in the title song is particularly praiseworthy. Others like Kunal Ganjawala, Shreya Ghoshal, Richa Sharma and Alka Yagnik, too, have done well. The only fault is that the music overall is not quite as young as one would have liked for the launchpad of a new star couple. Romance is the theme running through all the 11 songs, including a reprise of the title number. It is the slow songs like Daras bina nahin chain (Richa sharma, Shail Hada, Parthiv Gohil) which leave the maximum impression. These have been penned by Sameer, except Thode badmash ho tum, which has been written by Nusrat Badr and Yoon shabnami by Sandeep Nath. Interestingly, the composition of Thode badmash ho tum is credited to film’s director Sanjay Leela Bhansali. The cover of the CD is a veritable album of the photographs from the film. Madhuri Dixit’s comeback vehicle has to have dance songs aplenty. Not many of them are worth writing home about. But that weakness is more than compensated by one song, the title one. 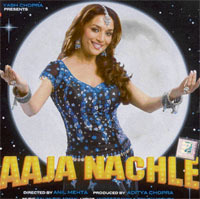 Aaja nachle has such an infectious beat that it virtually forces you to dance. Music director duo Salim-Sulaiman have strived to make it as much of a folk song as Jhumka gira re Bareily ke bazaar mein from which it faintly takes off. A major triumph indeed for Sunidhi Chauhan. The reprise of this song, which is only a new word for a remix, is not that impressive though. The only single by a male voice is Ore piya by Rahat Fateh Ali Khan. Most others are either duets or female voiced. Madhuri Dixit lends her voice to Soniye mil ja sung by Sukhwinder Singh and Sunidhi Chauhan.